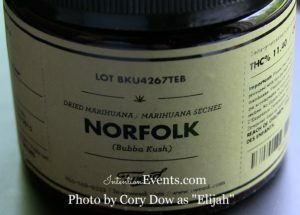 The 80% Sativa strain Norfolk is from the licensed producer Tweed. It is said to be a sticky “Kush” strain. Most batches are 11% – 13% THC and 0.01% – 0.10% CBD. The batch Elijah reviews below was at 11.4% THC. Patents have said that the use of Norfolk has left them relaxed, energetic, and creative, but at points has put them to bed. If you are experiencing trouble sleeping this may be just the thing for you! It is typically prescribed for Depression, Insomnia, ADHD, Migraines, Spinal Injuries and a number of others. We would LOVE to hear about your experiences with Norfolk and what conditions it has helped you with! Have a question before ordering? Elijah would be honored to answer you from his own personal experiences! Feel free to comment below. We want to hear from you!